I’m sure you still remember Threes, a fun (and addictive) number puzzle game for the iPhone. The app was a great success on the App Store, even reaching the top spot for paid iPhone apps. Soon afterwards, many people created their own versions of the game -- one of the most popular being 2048. It started as a free browser game, but quickly transformed into a free iPhone app with ads. It’s been the #1 free iPhone app for a few days now. 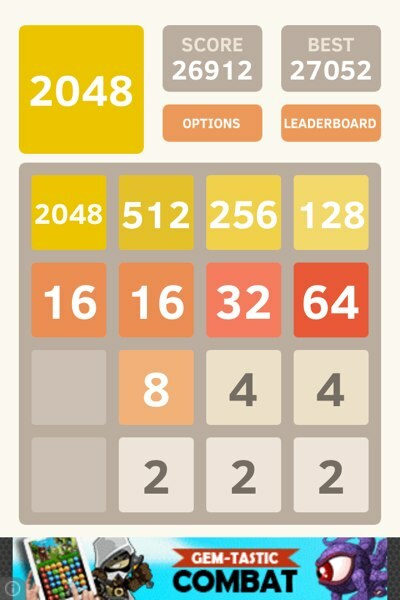 The new version of 2048 allows you to continue playing even after you reach the 2,048 tile. 2048 has a gameplay similar to Threes. It uses numbered tiles, and will combine two tiles with the same number into a tile of their sum. You play the game until you unlock the 2,048 tile or until the 4x4 board is filled with tiles. The recent update to this app allows you to continue playing after you reach the 2,048 tile. Compared to Threes, 2048 uses a different set of numbers. It uses 2, 4, 8, 16, and so on; Threes, on the other hand, uses 1, 2, 3, 6, 12, and so on. Swiping in 2048 will move all cards to an opposing wall, whereas swiping in Threes will move the cards one row/column away. In Threes, new cards will spawn in an empty space left behind my your action; in 2048, new cards spawn in random locations. The new cards are also only limited to either 2 or 4. The most consistent strategy to unlock higher numbered tile is by creating a chain, allowing you to focus on smaller goals but convertible to the end goal. 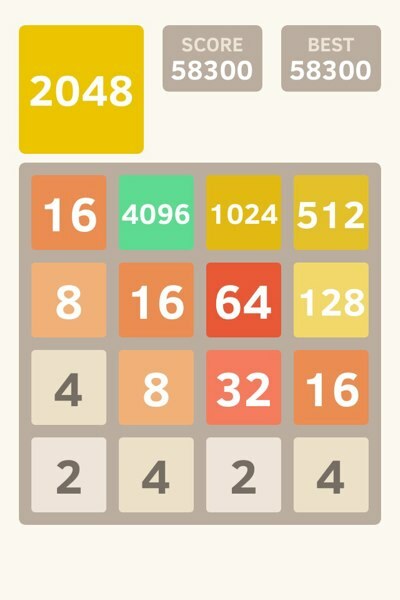 Compared to Threes, 2048 is a much simpler game; many players were able to unlock the 2,048 tile in their first few games. Once you understand the basic moves, you can try the so-called corner strategy similar to Threes to reach the 2,048 tile. But, if you want to unlock higher tiles, you need a better strategy. Here’s a strategy that I used to consistently reach the 4,096 tile. I am now working to unlock the 8,192 tile. Because you have made the top wall sticky, you should never swipe down. Instead, you should maintain swipe left/right mobility to avoid being forced swiping downwards. I usually leave the non-sticky rows movable. When you’re trying to create a chain, focus on getting the nearest numbered tile in the correct position. In the above example, if I have locked all the tiles from 128 upwards, I would focus my effort to create the 64 tile on the left side of the 128 tile. When I have completed that, I will focus on getting the 32 tile on the left side of the 64 tile, and so on. Going upwards to 4,096 tile (and higher) takes a long time. You must have the patience and a bit of luck (because of the random spawn locations), but everyone can do it. 2048 is nothing like Threes. Threes is a much better game from many perspectives: gameplay, complexity, hint system, music, and animation. But, 2048 is a good way to take a peek at what Threes has to offer. If you haven’t played either, try 2048 first. Try your best to unlock the largest tile, then move on to playing Threes. Both 2048 and Threes are available on the App Store.